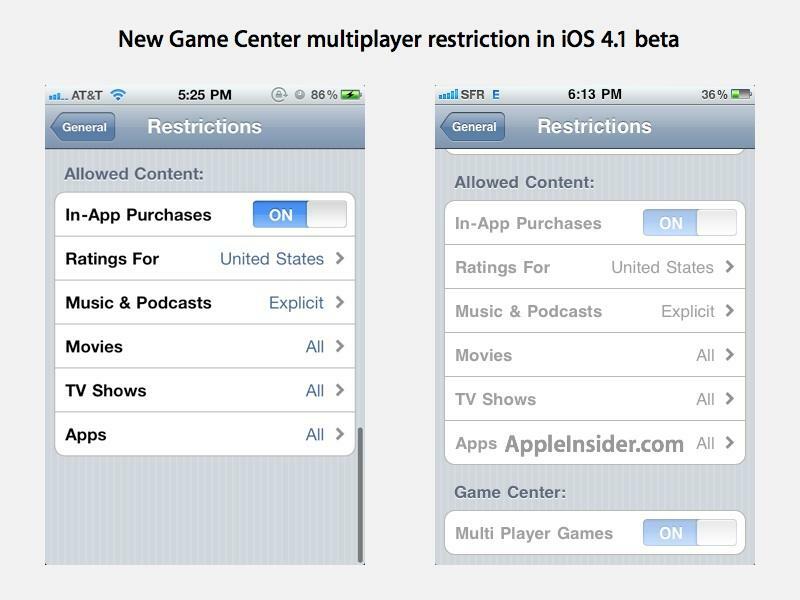 Apple has added a new option to restrict multiplayer games in developer builds of iOS 4.1, indicating that the new Game Center is approaching its official release to users. Restrictions within iOS enable companies (or parents) to turn off options for their employees (or children). Current options include turing off access to Safari or YouTube, the device camera or location services, and disabling iTunes content including in-app purchases, or setting a given rating threshold for music, podcasts, TV, movies and software. The addition of the "Multi Player Games" restriction in a new Game Center section of the Restrictions screen under the General page of Settings in developer builds of iOS 4.1 coincides with a new version of the GameKit APIs behind Game Center in the latest developer beta of the new release. Once bundled in a shipping version of iOS, Game Center will allow players to track their game scores on leaderboards, find teams for group play, and track their in-game achievements. The new restriction appears intended to allow parents to block their children from playing against other users without supervision. Game Center was touted by Apple as a major feature of iOS 4, signaling the company's efforts to support and attract high quality mobile games to the platform while making it easier for developers to add basic gaming features and more consistent for users who play multiple games. Game Center may ship with the final release of iOS 4.1 for iPhone and iPod touch, which is likely to hit in September/October. Apple is also preparing an update that will bring iOS 4.x features to iPad.